Seaward have recently introduced a new model to their Apollo range of PAT testers and they describe it as ‘A straightforward, no-nonsense PAT tester’. The Apollo 400 is currently available for around £525+VAT*, so it’s significantly cheaper than the existing Apollo 500 (£760+VAT*) and Apollo 600 (£926+VAT*) models. How does it compare to the Apollo 500? The tester is based around the same hardware as the Apollo 500 and carries out the same electrical tests. The only differences being changes to the firmware that limits the memory capacity and some of the additional features. To get it down to this price, accessories such as the soft carry case, 110V adaptor, and checkbox are no longer included. With the Apollo 400 you receive a power lead, a test lead with a probe and clip, a USB download cable, calibration certificate, and a basic quick start guide. The firmware changes have reduced the test record memory from 10,000 to 2,000 records, and similarly the number configurable test sequences have been reduced from 100 to 25. Although these numbers look like significant reductions, in practice it's unlikely that you would want to store 2,000 records without downloading the data, and the 25 test sequences should be enough for most users. The ability to upload previous test records for re-testing has also been removed. For the majority of users, especially electrical contractors, this really isn’t an issue. For those carrying out in-house testing it’s a nice feature to have, but certainly not essential. The more superfluous marketing features such as the ‘Risk Based Retest Period Calculator’ , ‘Clone Facility, ‘Password Accounts’, and ‘Configurable Checklist’ have also been dropped. The instrument itself is small, lightweight and well built. The colour screen and menu system are easy and intuitive to use. There are two main test options - predefined test sequences, or single test mode. Most users will probably just use the test sequences. 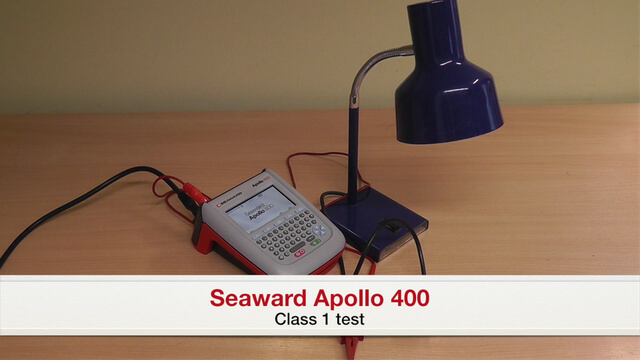 The video below shows a test on a class 1 lamp using the pre-set test sequence. It’s worth pointing out that we select the test ‘H’ using the drop down menu, alternatively we could just press the letter ‘H’ to initiate the test sequence. With a bit of use, most users will quickly remember the corresponding letters for the dozen or so most commonly used tests. The predictive text when entering the Location, Site, and Appliance Description is very good. If I had to pick a fault, there doesn’t seem to be an option to automatically input the next sequential number in the Asset ID column, it just reverts back to a blank space. But this a minor quibble and wouldn’t be an issue for re-testing appliances that already have an asset number. Overall it’s a quick and easy machine to use. One criticism we often hear about Seaward PAT testers is that they don’t include any software. Most other downloadable PAT testers include at least a basic version of software with the tester. Seaward’s PATGuard 3 software is available as 1, 3, or 5 year licence options. The one year license is £113+VAT, a three year license £304+VAT, and a five year license £477+VAT. If you use the discount code 'PLUG02' you will receive £10 discount off these prices. The Apollo 400 is also compatible with SimplyPats V7 software which is £354+VAT for a full licence. The Apollo 400 can also export the test records in a plain text ASCII file. This allows you to open the test data in a number of programs including Excel. Unfortunately the layout of the data isn’t great, but this could be improved by writing your own macro. Alternatively you can use our free ASCII file conversion tool. This is a simple online app that we have developed to upload your Seaward ASCII file and print the records, or convert and download the data in a .csv format. As with the the other Apollo models, the 400 is battery or 230v mains powered. When connected to the mains supply, the Apollo can perform a full load and leakage test at 230V. When on battery power a sub-leakage test can be used as an alternative. The insulation test can be set to either 500V or 250V for surge protected equipment. As with most other battery powered instruments, the earth continuity test is carried out at 200mA. Unfortunately there isn’t a high current (25A) earth bond option. Low current tests can sometimes suffer from problems with high readings caused by contact resistance. 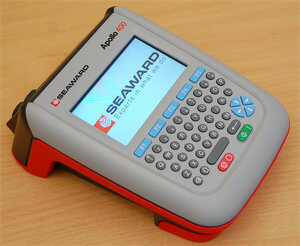 Seaward’s range of battery PAT testers incorporate what they call a ‘zap’ test circuit. This sends a short high current pulse to break through any oxide layers on the metal surface. In practice this works well and we didn’t experience any difficulties getting good continuity readings. Although the IET Code of Practice recommends that either a 25A or 200mA test can be used, the option of a high current test when connected to a mains supply would have been nice to see. The Apollo 400 also includes an RCD trip time test facility as recommended by the 4th edition of the IET Code of Practice. Seaward do not give exact figures for the expected battery life as this is very much dependant on the type and duration of the tests carried out, but they do state ‘we would expect you to be able to perform a full days testing on a single charge’. Whilst we have not carried out a full days PAT to test this, we have been using the Apollo 400 on our PAT courses and the battery life appears to be very good. What sets the Apollo 400 apart from other comparable PAT testers is the qwerty keyboard. This means its usability and speed is far better than other similarly priced testers currently available, such as the Metrel DeltaBT (£550+VAT*). Overall this is an excellent PAT tester, quick and easy to use. Many of the unnecessary features of the Apollo 500 and Apollo 600 models have been dropped making the claim of ‘A straightforward, no-nonsense PAT tester’ a fitting description. Price wise, it nicely bridges the gap between the Primetest 250 and the Apollo 500 models.